descriptive text is the text that is always in around us when we want to describe something or someone. 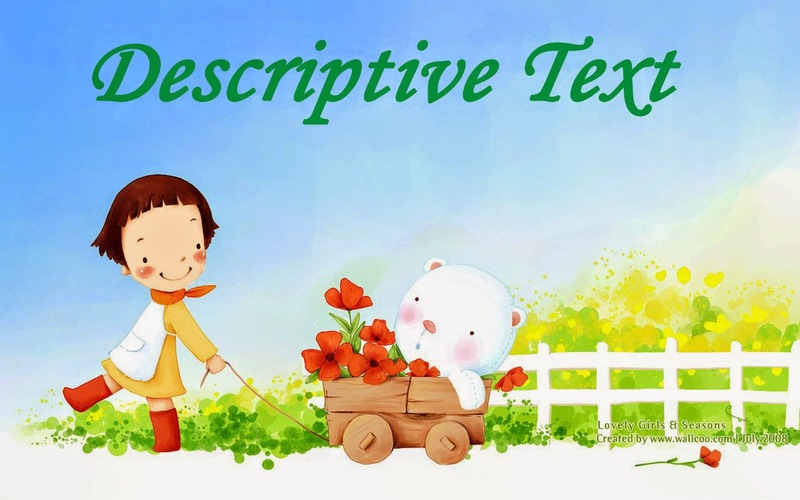 Descriptive text is a text which say what a person or a thing is like. Its purpose is to describe and reveal a particular person, place, or thing. * Identification to identifying the phenomenon to be described. * Description to describing the phenomenon in parts, qualities, or/and characteristics. The use of adjectives and compound adjectives. - a five hundred seated football stadium. - a beautiful ancient Roman opera house. The use of Linking Verbs/ relating verbs. - The temple is so magnificent. - The temple consists of five terraces. - The museum houses hundreds of Greek Statues. - The hotel provides 450 rooms and a large swimming pool. - The weather in Jakarta is hotter than Bandung. - Bogor has the same weather as Ungaran. i have a bench friend in my class.Her full name is Khandingasih,but i usually call her Khanding. Khanding is someone who is interesting person. either from her physical or her character. many people who say that khanding has a beautiful face, and I agree with that statement.in her physical khanding have white skin, the body that is not too tall, and she has black hair. khanding also has a pleasant Character. almost every day I laugh out loud made by her.She made me forget all the problems that happened to me when I was with her. I'm very happy can to be her friend.